The rolled ice cream trend has finally arrived in West Dearborn. Within a month of opening its second location in Michigan — with the first in Ann Arbor — the Thai ice cream chain, I-CE-NY, still has hundreds of customers lining out the door each day. And believe me when I say, these ice creams rolls are well worth the wait. Ice cream enthusiasts are bound to go crazy over the ice cream shop’s 12 specialty ice creams, like the irresistible vanilla “Cookie Spree,” garnished with brownies, Oreos, and chocolate sauce or the “Supreme Berry” topped with chopped strawberries, berries, and raspberries. For the ultimate summer meltdown, try their three limited-edition flavors: Honeydew Coconut, Pina Colada, and Coconut Sticky Rice. There is also a create-your-own special, so the ice cream roll combinations are truly limitless. The rolling operation starts with mixing a flavored powder — chocolate, sweet cream, or Vietnamese coffee to name a few — with your choice of regular or coconut milk. The ice cream mixture is frozen on a metal plate that can get as cold as negative 15 degrees. Then it’s scraped, rolled to into creamy perfection, and finally, topped with fresh ingredients. Strawberry and cheesecake are among the top customer favorites. 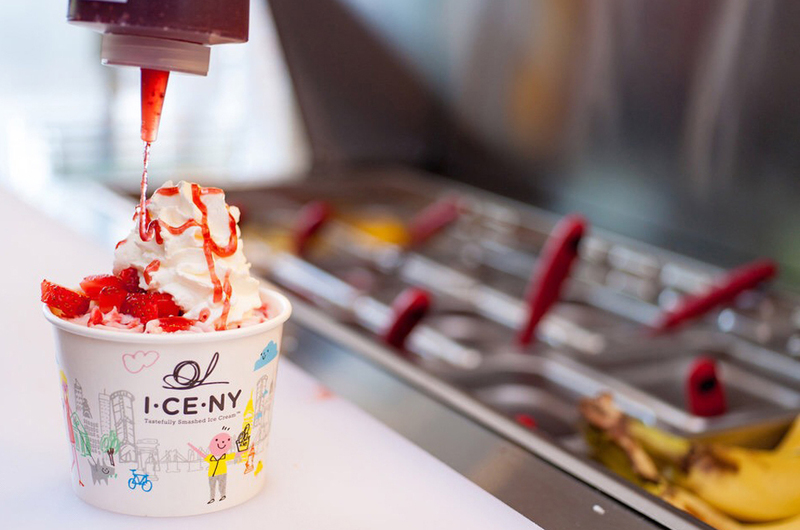 Owner and manager, Jamal Alaouieh, believes I-CE-NY stands apart from any other ordinary ice cream shop because of their quality ingredients and creative technique and presentation. “We don’t scoop our ice cream from a bucket,” he says. “Customers love the product and enjoy the process of it being freshly made in front of them.” It’s time to ditch the scoop. The rolled ice cream fad is here to stay.